Google continues its invasion of the desktop with a new feature that lets you use the search giant’s Cloud Print service from any Windows application capable of, well, printing. The new Google Cloud Printer is a small download that is basically a printer driver for the company’s online printing service. After the installation, you can send text documents, spreadsheets, PDFs, photos, or practically any other document you can think of from desktop applications to Google Cloud Print. The new feature is a handy addition if you want to print a file directly from Microsoft Excel to a remote printer. Previously, Google Cloud Print worked by letting you send a file to your Cloud-connected printers from Chrome for the desktop, smartphones, and tablets. Now, you can access the service from any desktop application, such as Microsoft Office or Adobe Reader. To get started, download Google Cloud Printer and install the EXE file like you would for any other application. 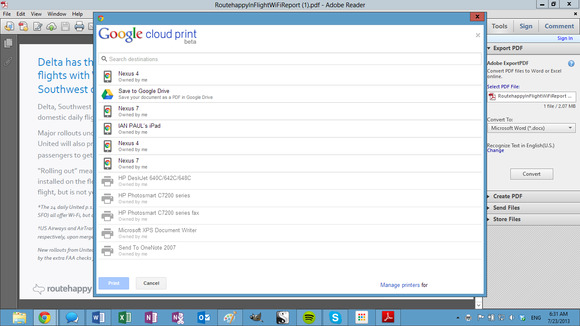 After that’s done, you’ll see an option for Google Cloud Printer show up in your print options across the desktop. 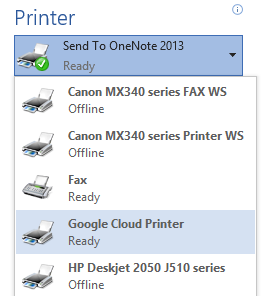 Google Cloud Printer will also show up as an option in modern UI applications able to print, but in my tests cloud printing from the touchy-feely side of Windows always failed. Part of the reason Cloud Printer may not work with the modern UI is that you still need Chrome for the feature to work. Once you’ve chosen to print a document with Cloud Printer, a Chrome dialog box opens in a separate window asking you to pick which of your Google Cloud devices you want to receive the job. This can be any of your smartphones or tablets, Google Drive, or an actual printer connected to your Cloud Print account. But for whatever reason, modern UI applications in my tests would not kick you back to the desktop to select a printer. Perhaps this will improve over time—the Cloud Print service is still technically in beta—but for now don’t count on using the new Cloud Printer driver with Windows 8 modern UI apps. In addition to Cloud Printer, Google also rolled out Google Cloud Print Service for Windows that lets administrators for large organizations manage Cloud-connected printers. This is the second big Cloud Print rollout for Google this summer. Earlier, in June, Google unveiled an Android application for the company’s print anywhere service.